Ivica Olic grabbed an injury-time winner as Bayern Munich drew first blood in their Champions League quarter-final with Manchester United. 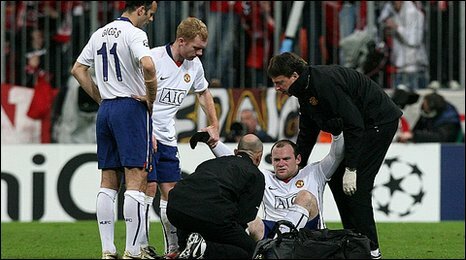 United had taken the lead after just 66 seconds when Wayne Rooney volleyed in six yards out from Nani's free-kick. But Franck Ribery's deflected free-kick set up a dramatic finale, rounded off by Olic's cool run and finish after a defensive error by Patrice Evra. United's misery was made complete when Rooney limped off with an ankle injury. And the England striker's injury could yet prove to be the major story of the night, with the 24-year-old apparently in severe pain after turning over on his ankle in the build-up to Bayern's winner. Either way, it was a poor night for United, who failed to build on Rooney's opener, allowing Bayern to take control of a tie now nicely poised ahead of the second leg at Old Trafford on 7 April. Sir Alex Ferguson's side will comfort themselves in the knowledge that they have that away goal, but should Rooney be missing in a week's time it is clear United have plenty of work to do to combat a Bayern side who are likely to be buoyed by the return of key winger Arjen Robben after a calf problem.And while United must wait and see if he is fit to start the second leg or, indeed, Sunday's Premier League match with Chelsea, England coach Fabio Capello will also undoubtedly be interested in news on the severity of the frontman's injury.